Whale Killing - who is Japan trying to kid? Japanese whalers must think the rest of the world is stupid. No one is going to accept that killing whales is for research. How can the photo from the Australian Customs Service, that accompanies this article, be scientific research? Two dead or dying minke whales - mother and baby - are being hauled onto the Japanese whaling ship so they can conduct research. What are they researching? The object of the research is to prove commercial whaling can resume. That is to make it legal to slaughter whales. The research includes sighting surveys and biopsy samplings from live whales. So why is it necessary to kill 850 minke whales, 50 fin whales, and 50 Australian Humpback whales. Mr Morimoto the director of Cetacean Research claims commercial whaling should start tomorrow. Japan is flying in the face of worldwide condemnation with their lethal research. 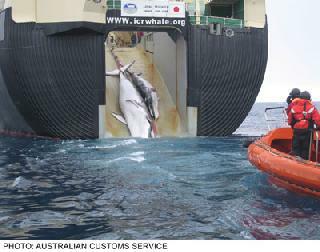 The International Whaling Commission stated that they don't want the information that the Japanese can provide. Perhaps a London report on Illegal Whaling says it all. Japan's whaling is primarily for so they can sell whale-meat. Japan is trying to tell us their whaling is for research, but no one is buying it. Imagine the carnage if they are successful and whaling is resumed. Thousands of whales slaughtered for the dinner plates in Japan. The scenes in the photo will become commonplace.